Tognini enrolled at the French Air Force Academy, Salon de Provence, France, graduating with an engineering degree in 1973. Tognini attended the Empire Test Pilots School, Boscombe Down, United Kingdom, in 1982, and the Institut des Hautes Etudes de Defense Nationale in 1993-94. Tognini served from 1974-1981, as an operational fighter pilot in French Air Force, flying SMB2 and Mirage F1 aircraft. Tognini was then posted to the Cazaux Flight Test Center, France, initially as a test pilot and subsequently as chief test pilot. Tognini has 4500 flight hours on 80 types of aircraft (mainly fighter aircraft including MIG 25, TUPOLEV 154, LIGHTNING MK 3 and MK 5, METEOR, and F 104 Tognini made his first space flight on board the Soyuz TM-15, TM-14 (July 27 to August 10, 1992). He linked up with Mir 1, spent 14 days carrying out a program of joint Soviet-French experiments. 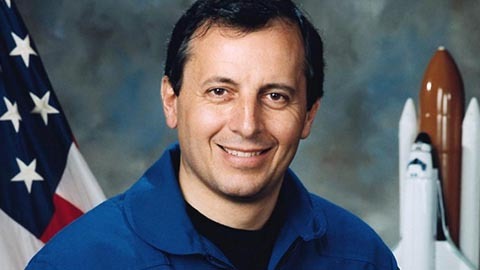 Tognini flew aboard Space Shuttle Columbia on STS-93 (July 22-27, 1999), as a Mission Specialist, to assist in the deployment of the Chandra X-Ray Observatory, Mission duration was 5 days. On May 1, 2003, Brigadier General Tognini was appointed Head of the Astronaut Division at the European Astronaut Center (EAC), Cologne, Germany. Then on March 1, 2005, he was appointed Head of the European Astronaut Centre. He came back to France in November 2011, and became the president of the GAMA (Groupe Aéronautique du Ministere de l&#39;Air); he continued to participate to studies linked to Human Space Mission to Mars or to asteroids. He is President of Space conseil and expert APM (Association Progrès du Management).